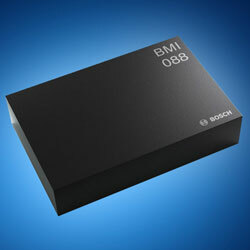 Mouser now stocks the BMI088 high-performance IMU from Bosch Sensortec. Using the company’s proven automotive technology, the device provides a remarkably stable, low-noise six-axis inertial sensor intended for industrial and harsh-environment drone and robotics applications. The IMU includes a 16-bit digital, triaxial accelerometer and a 16-bit digital, triaxial gyroscope to precisely measure orientation and detect motion on three orthogonal axes. The device provides acceleration ranges of ±3g to ±24g and gyroscopic slew rates up to ±2,000-degrees per second. The high performance and high speed of the device allow it to suppress vibrations, which can help provide smoother navigation and evade crashes in applications such as drones. The device offers vibration-quelling speed and 16-bit accuracy to allow ultra-low drift maximum bias drift of 2°/hour. The device is compatible with the company’s other sensors such as the BMI085 IMU to ease integration into current designs and comes factory calibrated and ready to use in a compact 3mm x 4.5mm x 0.95mm package. For development, the device shuttle board allows designers to gain easy access to the sensor’s pins via a simple socket. And as all Sensortec sensor shuttle boards have the same footprints, they can interface with the company’s other advanced development tools for optimal flexibility.